I started working, interning, and am taking two classes, so I haven't had time to write a post in a couple of weeks. But I wanted to get up this Chicken Tortilla Soup recipe, even though it's about 7:30am :-). My boyfriend had been asking for me to make some, so I finally did based on the Pioneer Woman's recipe. This one is tomato based with lots of veggies, which means yummy AND healthy, just how I like it. It's also really easy and cooks pretty quickly. Preheat oven to 375. Mix the cumin, chili powder, garlic powder, and salt together in a small bowl. Lay chicken breasts on baking sheet and drizzle with olive oil. Sprinkle each side with the spice mix. You will have some left over, so just set that aside to use later. Bake chicken for 20-30 minutes depending on thickness of the chicken breasts, until cooked through. Once it's done, shred with two forks or place in an electric mixer to shred. Heat the second Tbsp of olive oil in a soup pot. Add the onion, peppers, and garlic. Begin sauteing, then add the rest of the spice mix. Once almost soft, add chicken, and combine. Next, add in the Rotel, chicken stock, tomato paste, hot water, and black beans. Bring to a boil, then reduce heat to a simmer. Simmer for 45 minutes, uncovered. Mix cornmeal with a small amount of warm water. Pour into the soup, then simmer for an additional 30 minutes. This adds a nice toasty corn flavor. Continue to check the flavor of the soup. I ended up adding about an additional 2 tsps of salt and it really helped bring out the flavor. Remember, we're already using low sodium chicken broth, so adding salt may be necessary. You may also want to add more chili powder, etc, depending on your personal taste. Turn off heat, and allow to cool for 25 minutes. 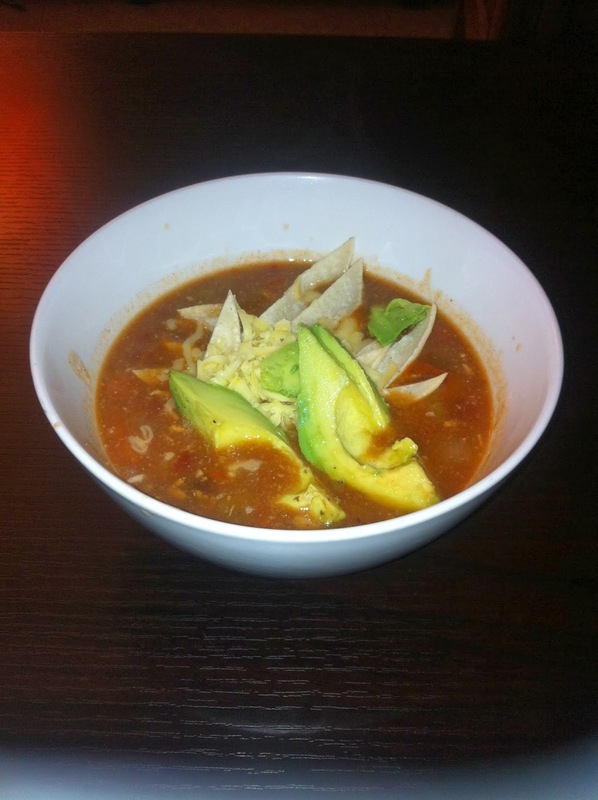 Ladle into bowls while still hot, and add tortilla strips or tortilla chips. Add avocado and any other toppings you like. Keep them healthy and you have a great, low carb meal that's also good for leftovers! And everyone in your office will be wondering what smells so amazing when you reheat it. :-) Enjoy!